Following the Hal Koerner 50 mile training plan I ran my first 30+ mile training run on Saturday, April 2nd. The day started at Buck Creek Gap (intersection of HWY 80 South and the Blue Ridge Parkway). Followed the Mountain to Sea trail west 8 miles to the Black Mountain Campground. The trail continues, overlapping the Black Mountain Trail 5.5 miles to Mt. Mitchell. 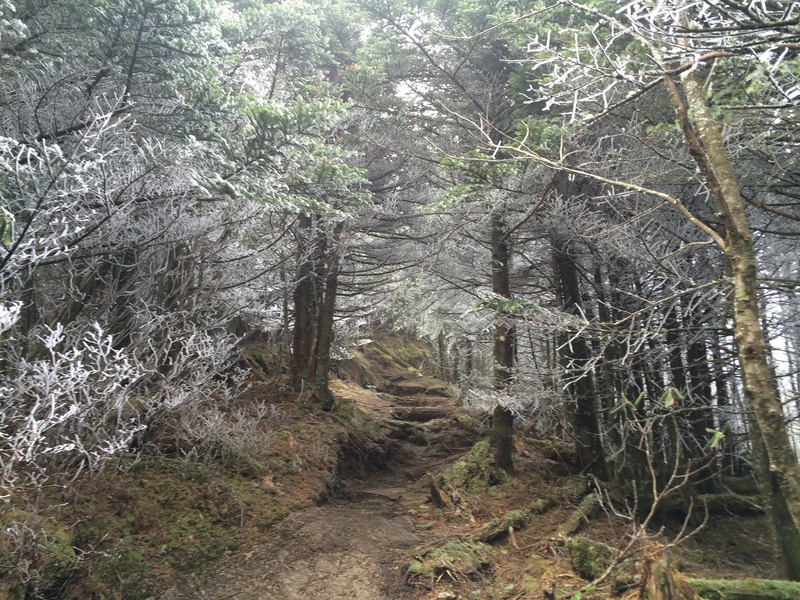 Just below the summit, the trail intersects with the Commissary Ridge Trail (overlapped by the Buncombe Horse Trail) veering off to the left. Going down Commissary about a mile the BHT begins a 4.2 mile descent to South Toe River Road. About 2.2 miles down STRR back to the Campground where I rejoined the Mountain to Sea Trail back to Buck Creek Gap. Quite a day. Never thought I'd do a 50K as a training run. One thing I LOVE about running is that there are always new firsts. First time running a trail. First time running a certain distance in a certain time. Most miles in a day, a week, a year, etc. I just had a new first: running 25 miles on consecutive days. Yesterday I did 25 miles on the Mountain to Sea trail from HWY 74 (Reynolds) through the Arboretum, up Shut In and beyond Hard times (and back) with about 6400' of elevation change. This morning, I did 25 miles along HWY 19 that had about 3200' of elevation change. Both days I focused on staying relaxed, running easy, and keeping my heart rate down. I'm really liking Tailwind products. Dissolves quickly, tastes amazing with no lingering aftertaste, and provides a great easy to digest source of calories and electrolytes. 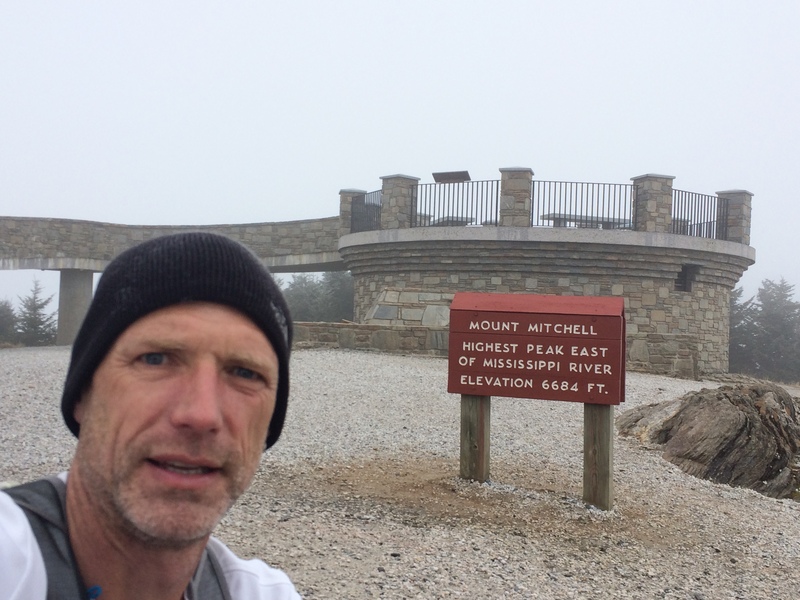 At 6684 feet, Mt Mitchell is the highest point east of the Mississippi River. Lucky for me, I live in very close proximity to several trails that connect to the Black Mountain Crest Trail, an enormously rugged, steep, challenging trail. The Black Mountain range includes 14 peaks over 6000' feet. 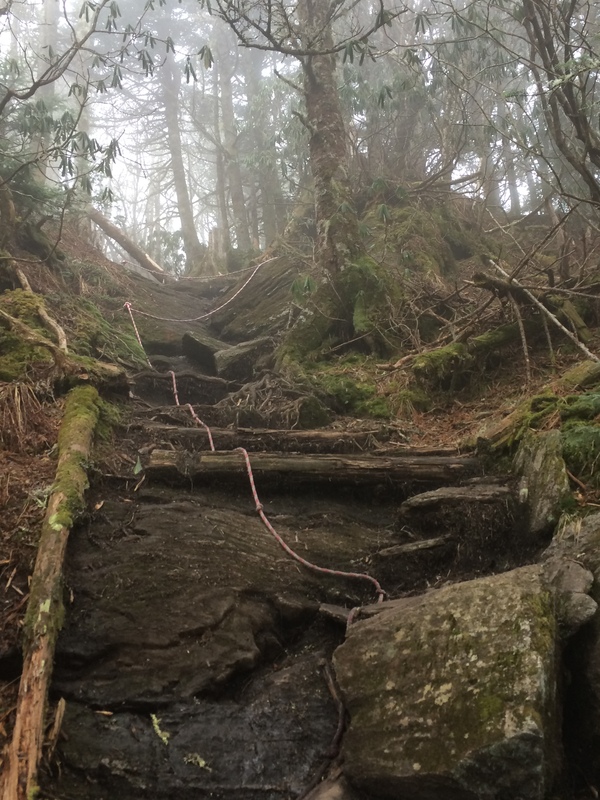 Last Saturday, I climbed the long rocky Buncombe Horse trail, climbed the impossibly steep Big Tom spur to the Crest Trail. Up over Big Tom (6580'). Up and over Mt. Craig (6663') and finally into the Mt. Mitchell state park. 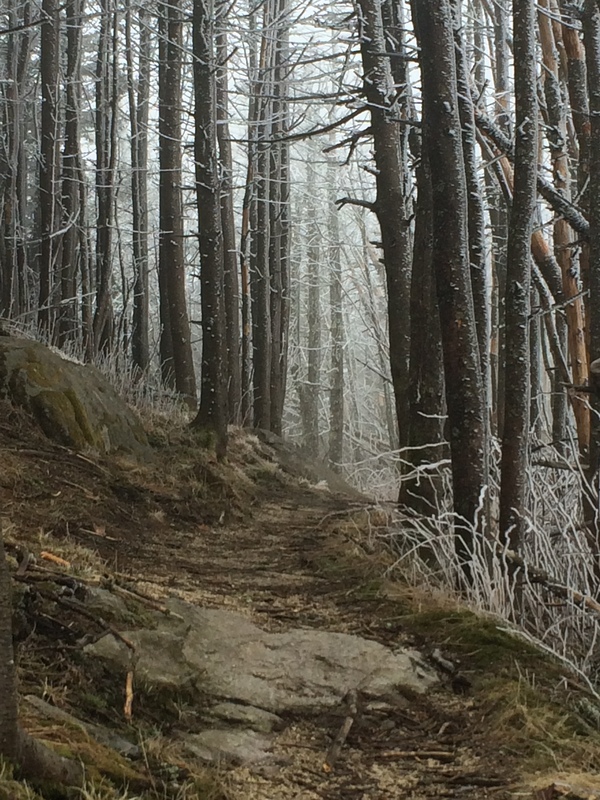 The day was overcast and cold, the trees covered with ice, the mountains shrouded in fog. Reaching the parking lot, a giant pile of dirty snow shoved to one corner, I jogged my way up to the observation tower atop Mt. Mitchell. A man photographing plants was the only other person on top of the mountain. After a couple of quick pics, I turned and made the 8.5 mile run back down. Did not see another soul on the trail all day. Film from the inaugural Worlds Hardest 50K run entirely in the Black Mountain Range of Yancey County, North Carolina. Enjoy! 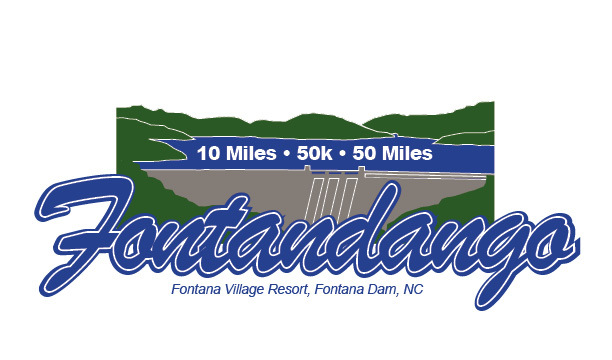 I had signed up for my first 50 mile race, the Fontandango 10/50/50. I'd done four 50K events in the last year and was ready for the next challenge. I used Hal Koerner's training guide, and was able to stay healthy. Several factors lead to me not completing 50 miles yesterday. 1. Went out too fast. When running on the A.T. or other steep mountain trails, I generally average 14:00 - 15:00 minute miles. Yesterday's course gained 2000' and dropped 2000' each ten mile loop, including one stretch in the last 3 miles that was nearly vertical. I ran the first loop in 2:02 (12:12/mi), the second loop in 2:07 (12:42/mi), and the third loop in 2:20 (14:00). I think the first two laps cooked my goose. I finished that third circuit feeling light headed and disoriented despite pushing 250-300 calories an hour. 2. Logistics. My race started at 9:15 a.m. which felt like a late starting time. I drove two hours and forty five minutes to get there, which meant getting up at 4:30 am. The area was very remote and I'm sure the FootRx staff wanted to give runners a chance to get there. Anyway, had I run a more conservative 15:00/mi pace, I wouldn't have finished until 9:45 p.m. and then would have had to drive three hours home. 3.The loop course made dropping 'easier'.The 10.2 mile loop's start finish was right in the parking area, unlike the Frosty Foot 50K or the Quest for the Crest 50K. Once the gun went off, you were committed. 4. I did not hit the back to back long runs in training. A full time job, ten hour commute, and a totally disable spouse create unwavering demands on my time and energy. I didn't really hit any of those 25/20, 25/25, 30/7 weekends. My weekly mileage was in line with the training plan but lacked many of the big Sat/Sun pairs. Likewise, I felt bad leaving my wife alone with the possibility of not getting home until after midnight. After dropping, I ate 4-5 orange slices (I hadn't seen those before or during the race), some cola, and two small cups of hot chicken broth. After 15 minutes of gentle walking and stretching, my head felt clear. Had I not dropped right away (My head had NEVER been in that bad of shape after 30 miles) maybe put my feet up for a few minutes, I might have spent 15 minutes recovering, then carried on, possibly doing at least 40 miles which would have been a new distance record for me. I had promised my wife that I would not do anything silly so, at age 49, I let discretion be the better part of valor and called it a day. Despite not reaching my 50 mile goal, I was the 3rd overall male at the 50K distance so that was a bit of a consolation. Over the past decade, ultrarunning has gone from a fringe pursuit for distance freaks to a hypercompetitive sport attracting big-time sponsors. But a mysterious training condition is suddenly plaguing its ranks, robbing a generation of top athletes of their talents and forcing victims to wonder: Is it possible to love this sport too much? Been doing more running on the Mountain To Sea trail in and around Asheville. Topologically, Asheville rests in a flattish plain, surrounded by steep, rugged mountains. The MTS trail in the area offers miles and miles of runnable, rolling hills. In contrast, running in the Black Mountains or on the AT requires numerous, gut busting grinds or hands on knees power hiking. Both of those are good for gaining strength. The MTS in Asheville offers the chance to run, uninterrupted, for long periods. 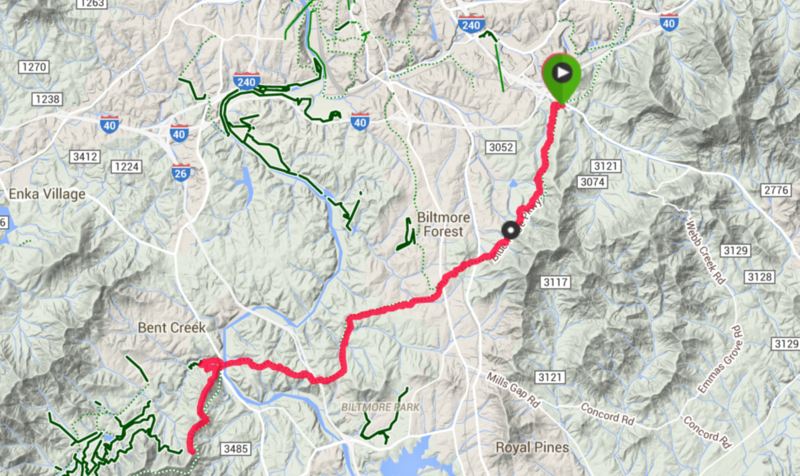 Last weekend, I ran from the trail head at the HWY 74A/BRP intersection west to I-26 and back for a 16 mile day. Yesterday, I went from Hendersonville Road, across the French Broad, through the Arboretum, and up Shut In to Hard Times Rd and back for 15.2 miles. I averaged about 11 minute miles running at a comfortable effort. Compare that to my average pace on the AT which is around 14 minutes/mile. One drawback is the traffic noise from I-26 and the BRP audible from the MTS trail. The A.T. and the Blacks offer that soul-calming isolation. Had high hopes for a good long run. Things aligned and I cranked out a 22.4 miler with 15,000 elevation change about 40 minutes faster than I had run that same route on two prior occasions. I took Friday off, no running. 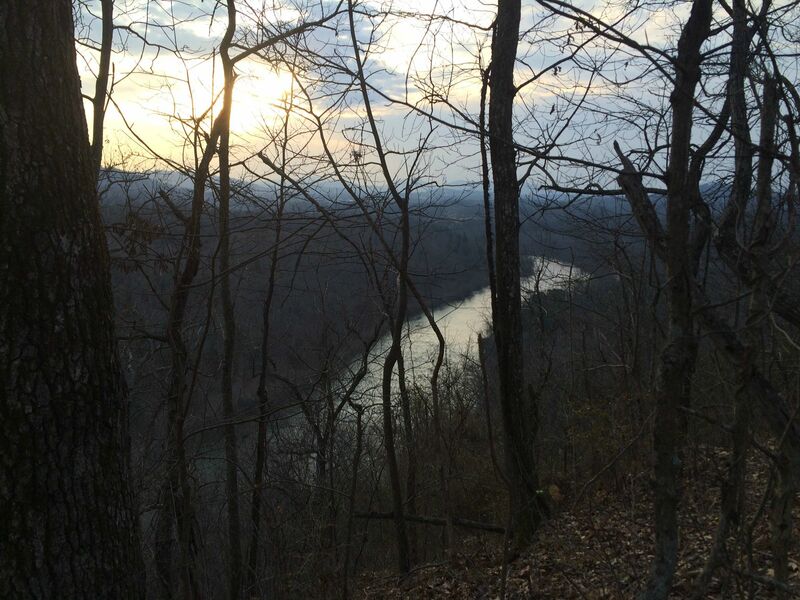 Left the Spivey Gap trail head at 7:00 Saturday morning. The weather was perfect. 21 degrees, clear, and no wind. I had, for once, just the right amount of layers so that I wasn't freezing and I didn't burn up. I clambered up the steep start, power hiking for the first ten minutes or so to get warmed up. About 45 minutes in I was feeling really good. Everything felt smooth and easy so I decided to try to make this a personal best day. 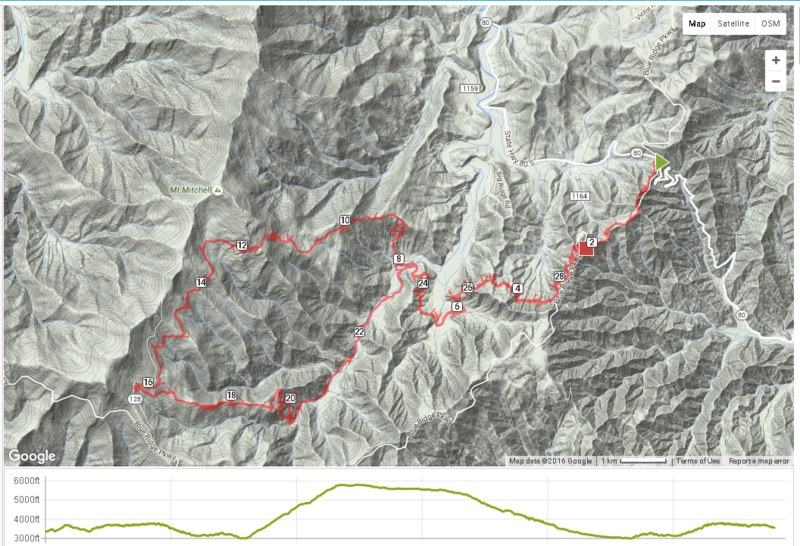 This stretch, from Spivey Gap to the Nolichucky river is about 11.2 miles with 7500 feet of elevation change. I'd had things go sideways on this run before; hitting the wall on the back. My energy, stamina, and stomach all stayed good and I didn't falter and was able to keep the power hiking to a minimum. One of my running motto's is "Train in a manner today that makes it possible to train tomorrow." This has served me well; kept my injuries to a minimum and helped me avoid burnout. Sometimes, though, its good to test oneself, to lay down a marker, to stretch and reach. I finished the day feeling fulfilled. Feeling like I could have run 30. Feeling like if I hadn't gone all out, I could have run 50.